You'll recall, if you've been reading this blog with any attention, that I built this house in a hurry, as protection from winter, at a time when I was broke and suffering significantly from depression, and with the intention that it should be a temporary dwelling while I sought planning permission for the house I really wanted to build. There were things which were done poorly, partly because I was broke and partly because I wasn't anywhere near the top of my game. 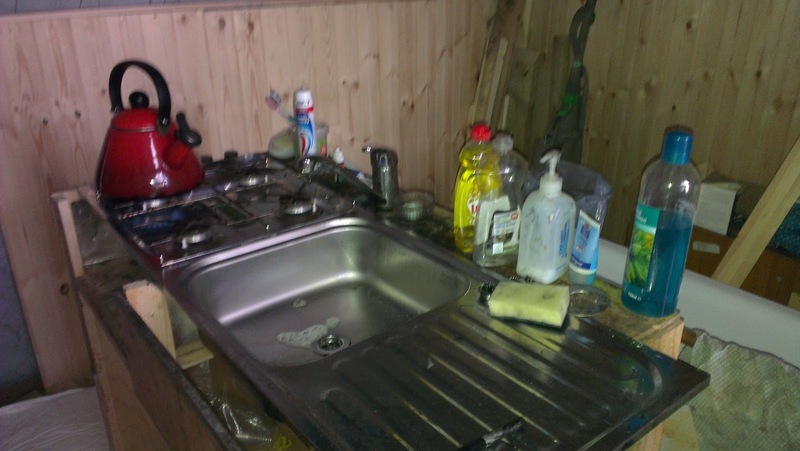 I salvaged a gas hob a caravan that was being demolished. It was free, and was a heck of a lot better than the camping stove I'd used in the summer palace, but it was partly broken and burned poorly, creating lots of soot. I couldn't work out how to get to the jets to clean them, and over time all my pans became hideously sooty. Over the past six months, I've become increasingly aware that the dirt it was producing was itself depressing me. Then, the hot water system. The hot water system was put together in a hurry, and not well. I plumbed the hot cylinder directly into the thermosyphon circuit rather than using its indirect coil, largely because doing so used less copper pipe and copper pipe is expensive. This meant, of course, that iron sludge from the back boiler in the stove accumulated in the cylinder and stained the hot water, which again isn't perfect. Furthermore, the water in the cylinder boiled if I tried to get the oven hot enough to cook in, so the amount of cooking I could do with the stove is limited - I could neither bake nor roast. I'd intended to put the bath under the stairs, behind the back of the stove. Again it meant less plumbing, but it seemed like a good idea at the time. 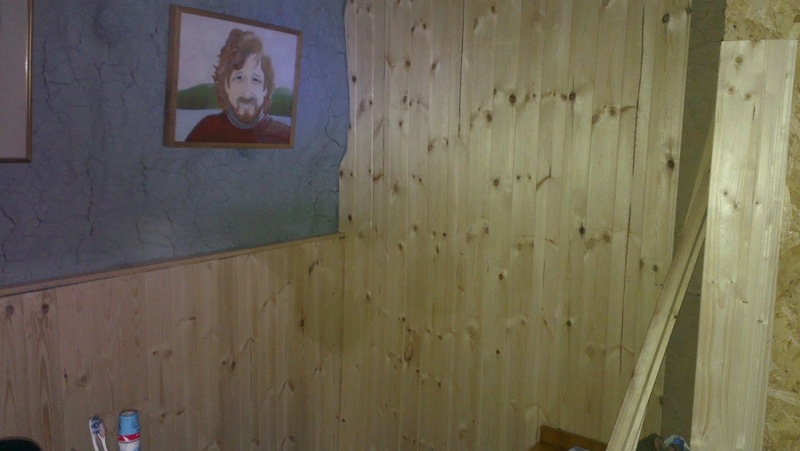 I didn't want to put the bath directly against the clay-rendered walls because, of course, water has a rather disastrous effect on clay render. But in practice the inevitably dark corner of the house between the wall, the bath and the hot water tank became and remained a rather dirty dumping ground for all sorts of unwanted items, and that too left me less than cheered. Finaly, I'd made the structure which supported the water tank very quickly and not well out of unwanted left-over scraps of wood, and it looked a mess. It reminded me whenever I saw it of how rough I'd been when I made it. Taken together, all these things mean that I'd never actually photographed that corner of the house, which is why there's no real 'before' picture in this post. And so many things in the house needed to change. One of the things I planned for this winter was what I called in my head 'the great replumbing'. Firstly, I have panelled the rear corner of the house with match-boarding, on the back wall up to 'dado-rail height', on the north wall right up to the wallhead. This is a bit experimental. In theory you shouldn't have any structure joining the sill plate to the wall plate on a structural bale wall, because the bales should be allowed to compress naturally. However, the walls have been up eighteen months, and they have not compressed very much; furthermore I'm guessing that they've done most of the compressing they're ever going to do, at least until the house finally rots. Secondly, I've made a new cabinet - properly, or, at least, very much better - to house the water cylinder; this one has a proper storage cupboard, with a door, under the cylinder, and an airing cupboard beside the cylinder. Then I bought a second hand gas hob unit off eBay, which arrived beautifully packaged. It doesn't exactly fit into the cabinet I made for the old one, but is good enough. It burns clean, is easy to maintain, and as an added bonus, has four rings instead of two. I bought two radiators, one a heated towel rail, one a panel radiator as big as I could fit on the back wall. The objective of this was mainly to be able to pump heat out of the stove without boiling the water in the cylinder. And finally, with help from Fred Coleman, I replumbed. The thermosyphon circuit now goes through the indirect coil in the cylinder, so the water in the hot taps is now clean. The central heating circuit is taken off thermosyphon circuit, bypassing the cylinder, to allow me to dump heat. An electric pump is designed to circulate water through the central heating circuit. The bath is moved into the back corner of the house, against the newly panelled walls. And a lot of this has worked wonderfully. The house is so much cleaner! The former dumping ground is now definitely the most attractive, well finished part of the interior. With the central heating pump running, the house becomes very warm - warmer, even, than urban people keep their houses. The pump is quiet, and seems to use very little electricity. The new hob improves life enormously. So what hasn't worked, or, at the moment, doesn't work? I can't heat the hot water above tepid. For some reason, the water is preferring to circulate through the central heating circuit rather than through the coil. This is really critical, because for me long hot baths are essential to a good life. Also, the thermosyphon circuit still boils, if I run the stove too hot, so I still can't bake. The solution I'm considering is to fit a venturi tee to the return side of the thermosyphon circuit, where the central heating rejoins. This would mean that the pumped water in the central heating circuit would entrain water from the coil, effectively sucking hot water through it. However, as far as I can see it would still mean that the cylinder would only heat significantly when the pump was running, so I'm not convinced this is the optimum solution. What I want to do is heat the hot water preferentially and then switch on the pump when the hot water reaches a pleasant bath temperature, in order to dump excess heat into warming the house. However, the great replumbing has crystallised a thought which has been growing steadily in my mind for a year now. I like this house. I like it very much. I'm happy with it - contented with it. I don't actually want to build another.